We caught up with one of my original flatmates for dinner, and realised it had been far too long since the last time. We had a great time reminiscing about 'the old days' and all the people we used to know at the YMCA, which is where we met, as students fresh out of high school. The next day we wheeled the two suitcases to the Auckland Art Gallery, and I must say, Christchurch's footpaths are much more wheel-friendly. I set up my stall, and waited in anticipation for the hordes of people. It filled up pretty quickly, and was busy for the whole day. I had a lovely neighbour, Louise from the The Binding Studio who I got to know throughout the day. Luckily for me, Lucy from Felt had come up to check out the Fair, and kindly looked after my stall for a while in the afternoon. This gave me a chance to have look around at all the lovely things, and chat to some of the stallholders. It was great to finally meet some of the people whose blogs and tweets I've been following, including Blendy, Honey Design Books, Tiny Happy, Victoria n' Bird and Zippity Doo Dah, as well as catching up with Dear Colleen and Sarah from Songbird Designs again! I also got to meet the organisers, Jess and Kylie, who have done a great job of organising and promoting the Fair. 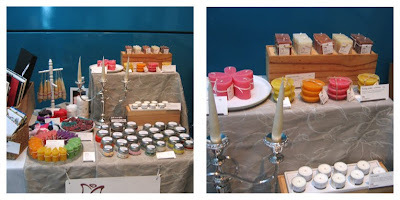 Yet again, I've only got photos of my stall. Please don't look at them too closely, I'm not good at taking photos indoors with no flash or tripod! I didn't think to get a photo of me behind the stall. By some strange co-incidence I happened to be wearing a top that was quite similar in colour to the wall behind me, which was made even stranger by the fact the wall was only that colour behind my stall. If you keep and eye out on the Auckland Art and Craft Fair blog, they are going to put some photos up of the event, so you'll be able to see what the rest of it looked like! your table looked so beautiful Rose, I was gutted I didn't get to come back and do some shopping, oh well — lucky you're on-line! 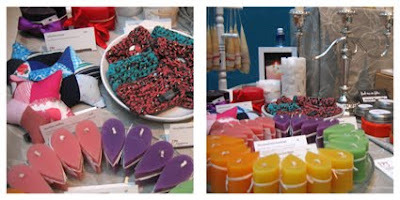 Your stall looks so colourful! and so well presented! Your stall looked beautiful! Looks lovely in the photos too, all those yummy colours!